MEDICAL GRADE PVC, COMPLETE CHILD SAFETY – Made of 100% Non-Toxic MEDICAL GRADE PVC, can contact directly with foods or be bitten by kids (unlike most other PVC materials), ideal for medical devices such as drug delivery devices, surgical tools and healthcare segments. 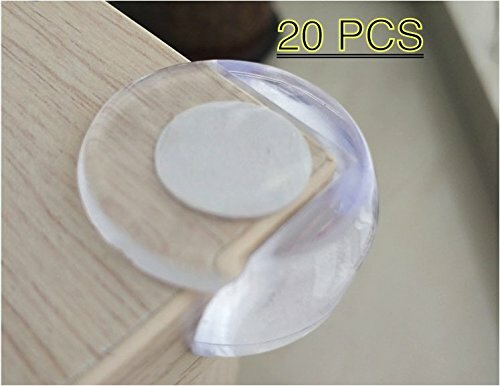 BALL SHAPE CORNER GUARDS WITH MATTE FINISH – Spherical bumpers absorb impact better to protect your baby from painful bumps – Suitable for right-angled “corner” tables, chairs, cabinets, etc – Can protect walls and furniture when move – Clear corner guards keep the beauty of your furniture. 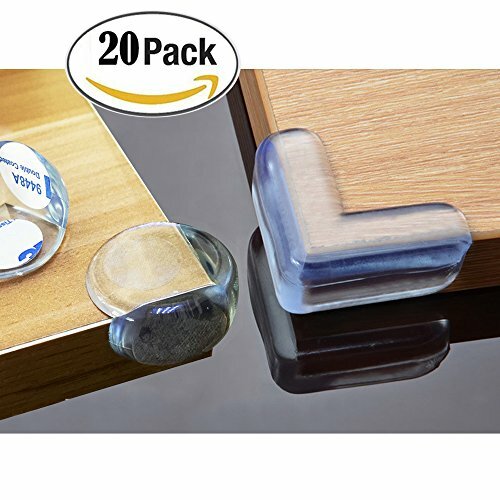 GUARANTEED TO STICK – These thicker gel-like adhesives are specially custom made for our ball shape corner covers, bringing stronger adheres – Curved edges with child proof design – ideal for flat and clean surfaces with right angles like wood, tile, glass, metal and plastic – Guaranteed TO STICK! 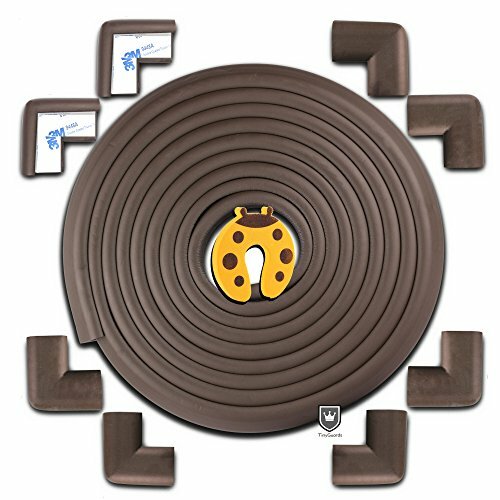 KEEP BABY SAFE – Baby proofing your home can be more challenging as your little one learns to walk; protect your child from sharp corners and edges with our deluxe corner guards. DELUXE 12-PACK – Look around your home from your child’s perspective, and place our clear baby bumpers on corners she might bump into. 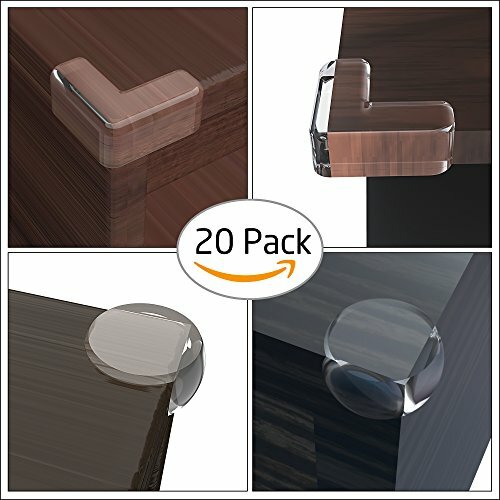 12 pack gives you enough corner protectors to cover all four corners of three tables, or one table and extra edges such as a desk or counter. 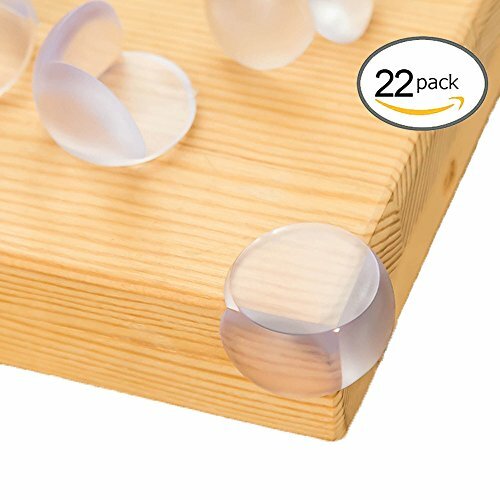 DELUXE ADHESIVE – These clear baby bumpers will stay right where you place them with extra strong non-toxic adhesive. 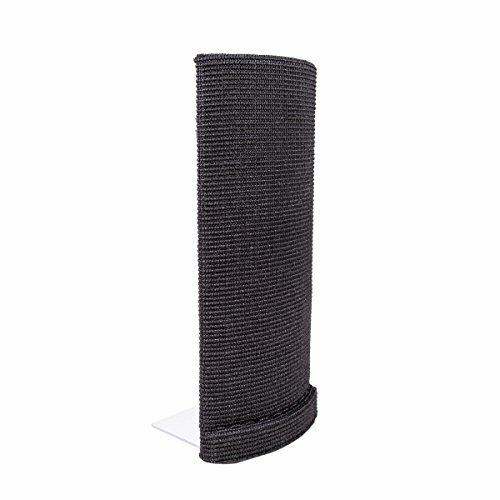 Never again worry that your little one will accidentally remove the corner guards that are protecting him from harm. This product contains no BPA, no phthalates, no heavy metals, no latex, no SCCPs.Soft, high-density premium cushions absorb impact and protect your loved one from the hard, sharp corners and edges in your home, school, daycare, preschool, hospital, assisted living facility, senior housing, work area, office, museum, restaurant, hotel and more. 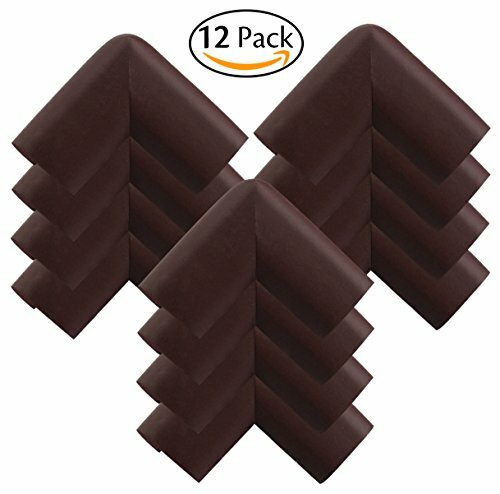 3*6.56 feet (19.68 feet/6 meters) edge cushion + 8 corner cushions — making this the most surface area covered by any product anywhere. Fits all standard size tables. 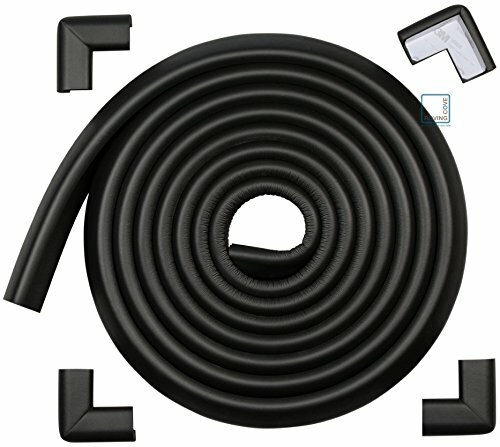 L-Shaped safety bumpers. Industrial strength; commercial length. The Soft, Dense, cushion guards will absorb the impact of bumps and falls to reduce injury. As your baby, infant, toddler learns to walk and fall over safely, there has never been a better time to protect your home from sharp corners & edges. You can even protect your walls and wall corners by attaching them onto baby walkers or equivalent. Work better to absorb impact and protect your loved baby against painful bumps, injuries and bruises from sharp furniture corners. Cover all the sharp corners extremely well on dining room table and kitchen counters, which also could used for office desk. Suitable for “corner” tables, desks, bedside units, chairs, chests, fish tanks, cabinets, shelves, stairs, hearths and other home furniture. Can also be used when moving furniture to avoid damage to furniture or walls. – CLEAR — want to keep your furniture aesthitically pleasing while keeping it safe?! Well these clear bumpers are hardly noticeable and are not like those eyesoring guards. 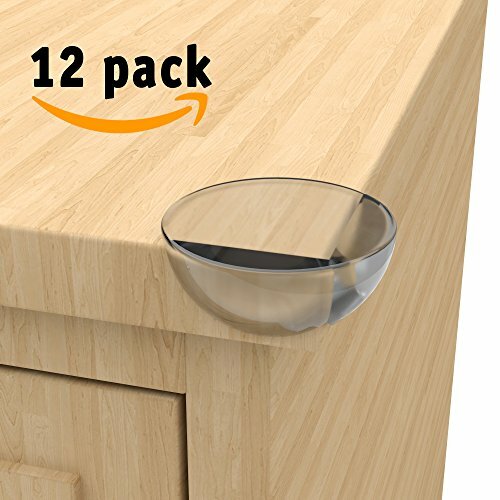 – SIMPLE INSTALLATION — You’ll have no trouble installing these corner guards!! – EASY TO REMOVE — Easy to remove adhesive, Place a moderately warm cloth over the corner and allow adhesive to soften, lift from one side and peel off. Any remaining adhesive can be rolled off and you can use a little bit of furniture polish for a final clean up. 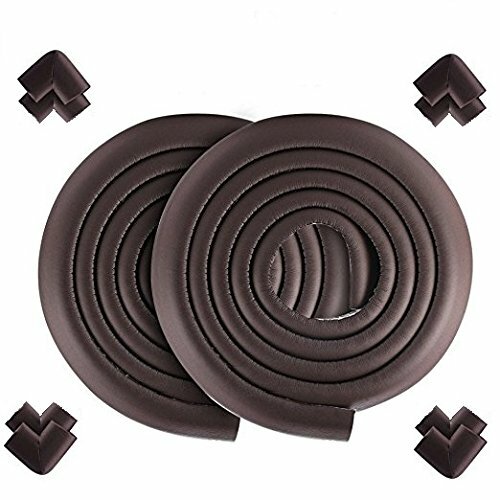 Child Safe & Soft Material: L-shaped with smiling face corner guards are made of 100% Non-Toxic, odor freechild-safe PVC material, Soft and flexible clear corner guards will protect your love one from the hard and sharp corners, to prevent the accidents happening by cushioning the corners. 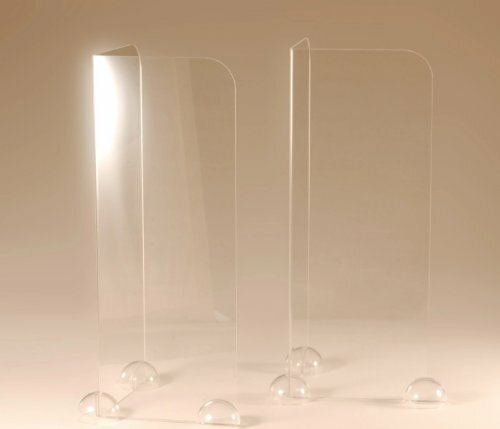 Beauty: Due to the Transparent material, they won’t be an eye sore in your beautiful home. Even they are with smiling face, no more bulk and ugly colored foam. Do not worry about that they take away from natural beauty of your furniture. And for moving furniture, protects not only the furniture corners from getting damaged but also prevents holes and marks in the walls! 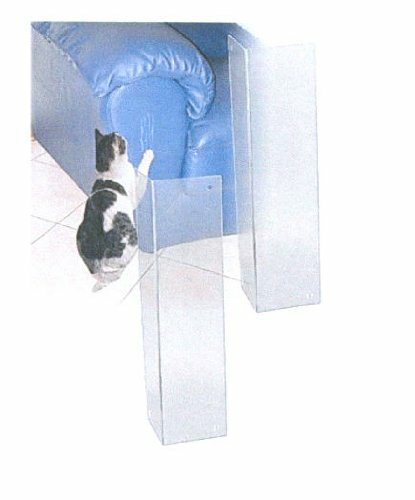 Easy Installation: Each corner guard include maximum strength adhesives, which is strong enough to stay on, but gentle enough to come off and not damage furniture. PREMIUM CLEAR CORNER GUARDS: Made of high quality PVC material, no pungent odor of plastic. 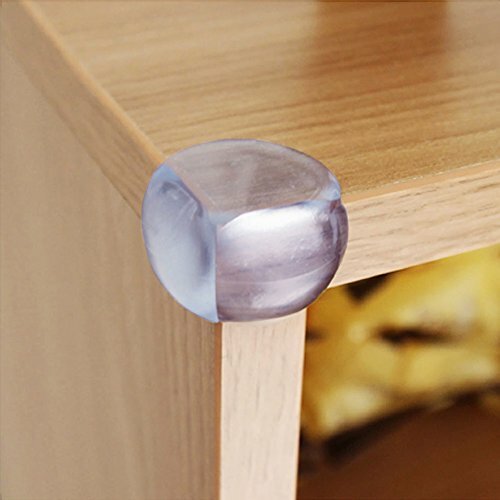 Ball corner guards design, soft & round enough to protect your baby from injuries of sharp furniture or table corners. 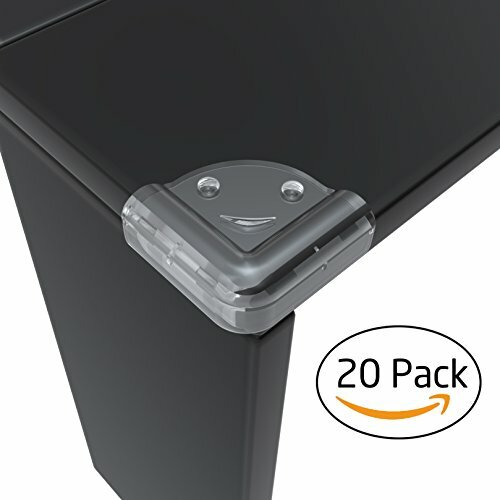 EFFECTIVE PROTECTION: 22packs soft corner protect your kids when they play from sharp corners on dining table, desks, nightstands, shelves and any other corner. 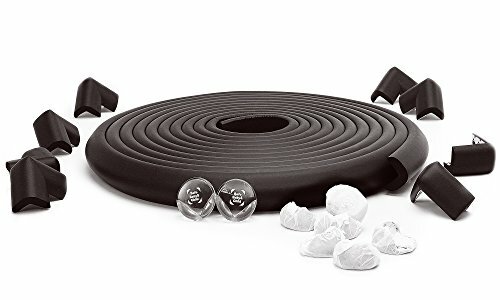 MULTIPLE USES: The flexible ball shape in addition to allows for safe child play around the house, and it can prevent accidental bruises on our thighs or arms. Even also be used while moving furniture to protect both your furniture and walls from damage. NO MORE WORRING YOUR BABY – Children have a strong curiosity and action,this product can help baby keep away from the sharp edges and corners,free to walk,run and play games at home without worried the pain and injury from hitting the furniture. SAFE METERIAL AND BEAUTY – Made of safe PVC material,Transparent and Beautiful,Reusable,Eco friendly and Safety for babies.Unlike the foam corner edge protector,it can not only protect the baby,but also keep the beauty of the furniture and our house. MANY USES! – Cabinets,Countertops,drawers,Fireplace,Nightstands,Coffee Tables,Dining tables,Thick glass tables(2cm),Appliances,Sharp door edges,edge of wall protector( keep paint from chipping) and so many more. Peace of Mind: Elf Star extra thick premium high density edge guard gives you excellent impact absorption and protect your loved ones against bumps, bruises, cuts from hard, sharp edges and corners. Perfect density, not too soft to absorb impact, nor too hard and causes bumps, which is ideal for Childproofing. Extra thick feature ensures excellent home safety. Child Friendly and Furniture Friendly: The durable edge guard is toxic free, odor free, SCCP free, phthalates free and fire-retardant. Cleanup is very easy, any spilled drinks or food and dusts can be just wiped away. 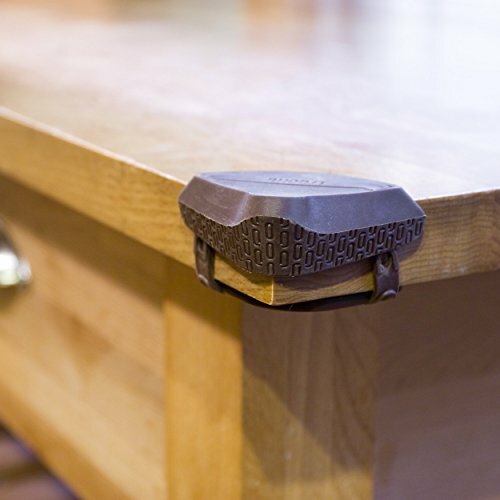 The edge guard can be securely fastened and quickly removed from furniture surface, without leaving any unpleasant damages, marks or residues. 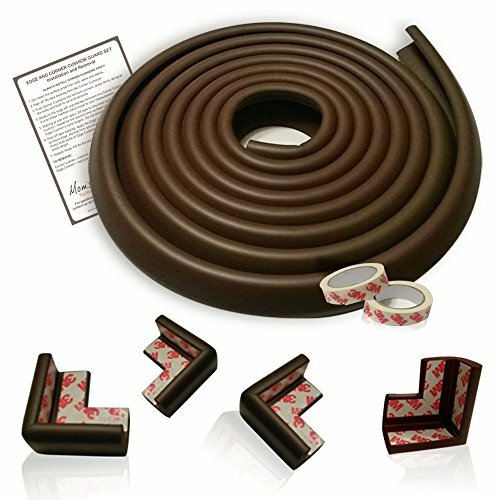 Extremely Versatile: The included authentic, industrial-strength 3M double-side tape make this edge guard suitable for most surfaces and edge shapes, such as wood & glass table, granite counter, fireplace hearth, fish tanks, ceramic edge, shelves, bedside units and more. 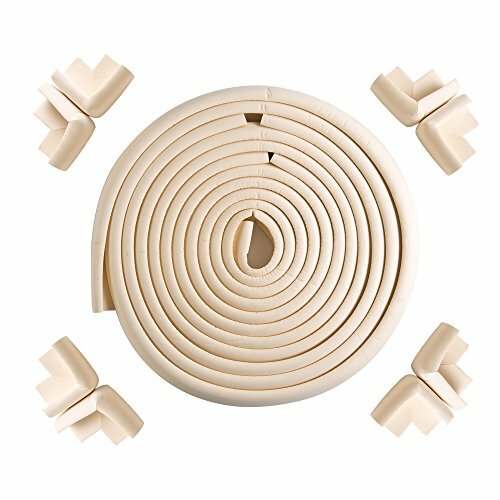 In addition, this baby proofing edge guard can also be ideally applicable to senior citizens or people with limited mobility or physical disabilities. 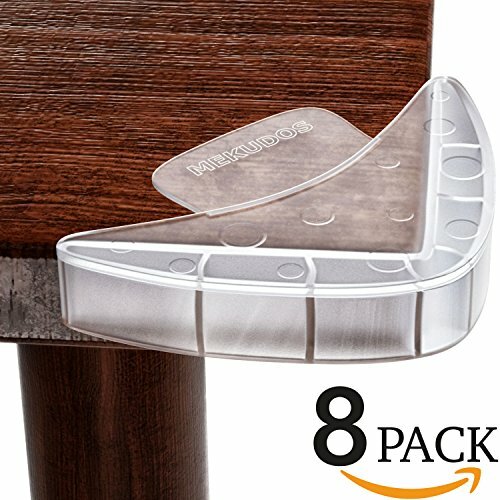 Applied to Various Occasion:Suitable for “corner” tables, desks, chairs, chests, cabinets, shelves, stairs, hearths and other home furniture.To protect your loved one from the hard and sharp corners in your home, daycares, nursing homes, preschools, schools, hospitals, offices, senior facilities, restaurants, hotels and more. First & Foremost Safety for Babies:We all know that babies are very fragile and they need the most special protection.These baby corner guards are made of premium PVC material,green &environmentally,non poisonous and tasteless,they are abrasion-proof and elastic.Ball shape to work better to absorb impact and protect babies against painful bumps, injuries and bruises from sharp furniture edges. Just a Few Minutes to Install:Protect babies safety is not an easy work,but our user-friendly and simple installation will help you solve a lot of headaches.Morever,you won’t even notice that they are there due to the clear and transparent appearance.They blend seamlessly and maintain the original look and feel of your furniture. 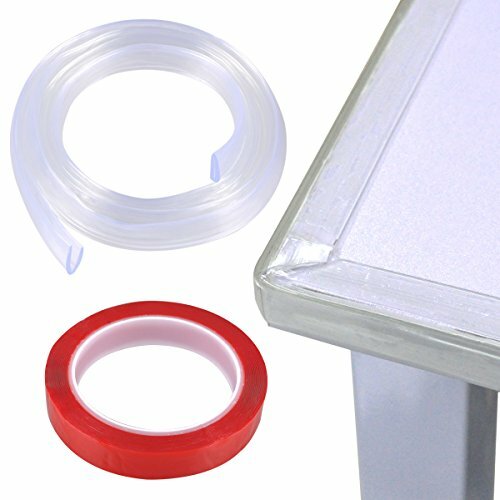 UNIQUE FEATURE – 3M TAPE PRE ATTACHED TO CORNER PROTECTORS! Babyproofing made convenient, efficient, and frustration-free. No alignments, no diagrams to follow, no wasted time – JUST PEEL the 3M tape AND STICK the corner cushions to furniture corners! The best answer to busy parents’ needs! OTHER FEATURES YOU’LL LOVE: Authentic 3M double-sided adhesive tape ensures the cushions WON’T come easily off, even with your toddler tagging on them. 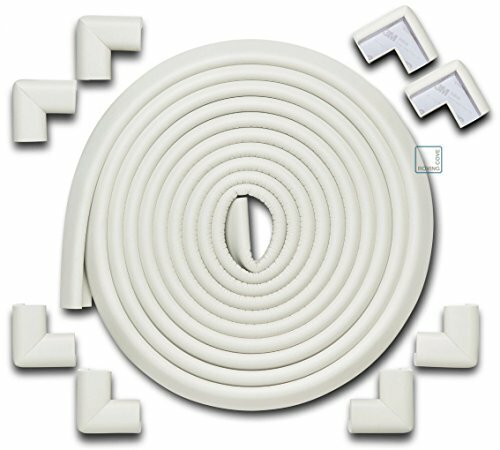 15 feet of edge guard – 3 feet MORE than the industry standard; extra strong and durable yet easy to trim to size and install without special tools. 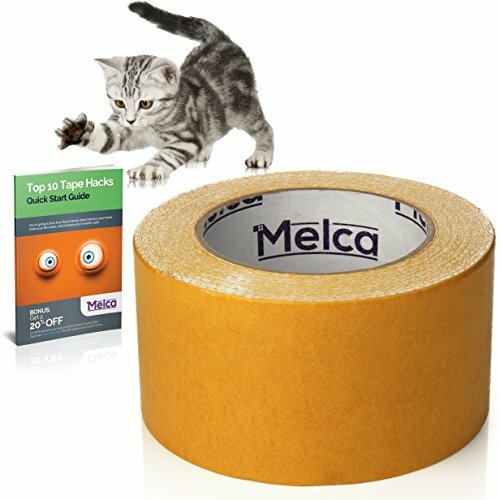 3-M tape on ROLLS for easy application on edge protectors. Best impact absorption with rubber foam almost TWICE thicker than other brands. Kids-safe, non-toxic, flame-resistant and latex-free. GENUINE ROVING COVE® PRODUCT: Roving Cove® is a New York registered trademark is owned by Mayapple Baby® of Brooklyn, NY. All of our product reviews are authentic. None of our “Verified Purchase” reviewers were given free or discounted products for their “unbiased” review. Beware of scam reviews. Beware of phantom sellers. DENSEST: Density is more important than thicknessTM when it comes to softening impact. Roving Cove cushions measure Shore A Durometer of 20-30, much more dense than industry standard of 12-15. Soft, high-density premium cushions absorb impact and protect your loved one from the hard, sharp corners and edges in your home, school, daycare, preschool, hospital, assisted living facility, senior housing, work area, office, museum, restaurant, hotel and more. DENSEST: Density is more important than thicknessTM when it comes to softening impact. Roving Cove cushions measure Shore A Durometer of 20-30, much more dense than the industry standard of 12-15. 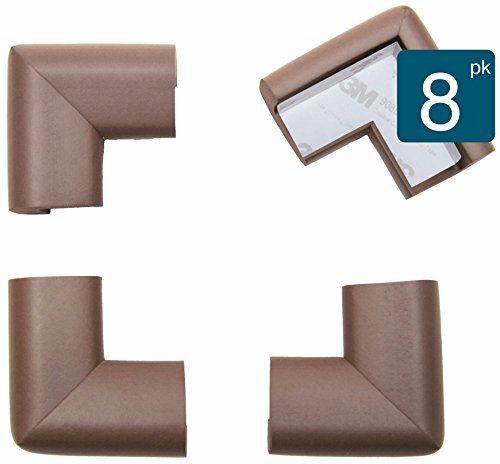 Soft, high-density premium cushions absorb impact and protect your loved one from the hard, sharp corners and edges in your home or at schools, daycares, preschools, hospitals, assisted living facilities, senior facilities, senior housing, work areas, offices, museums, restaurants and more. 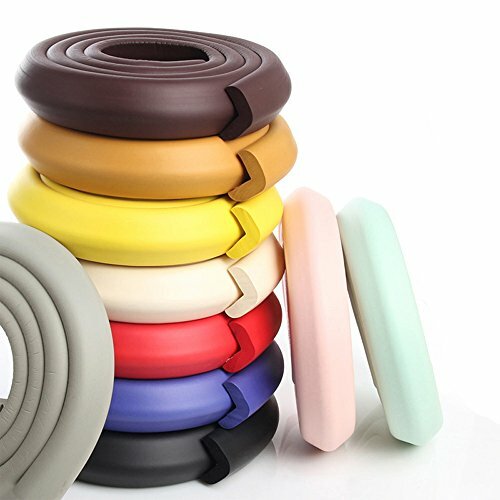 The Edge & Corner Guards made of polymer rubber,Soft, nice, eco-friendly, fire resistant, non-toxic, safe for child. 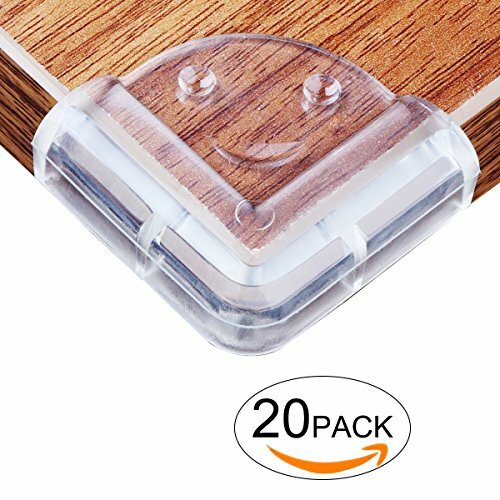 Simply peel adhesive tape backing cover, and place at the desired corner. Hassle free and very easy to install. Density and Thickness: our products are made of solid materials and it is great in density and thickness. It is durable and solid, you can use it for many years to come. It is much denser than industry standard and the thickness is more than satisfied. TinyGuards is a well-known USA brand name and dedicated itself to providing child safety products for a number of years. All of our products passed numerous testing and customers are confident in using our products. Any unwarranted sales of our products are strictly prohibited. Long and Flexible: it can cover most of the table and desk surfaces. Whether it is round table or square table. Our tape is 23.15 long and it includes 8 Corners Protector. It is suitable for furniture like tables, chairs, chests, shelves, stairs and fireplaces/hearths. YOUR CAT WILL NOT SCRATCH THESE…EVER. Cat Scratch Guard vinyl is 20 gauge (.020 or 20 hundredths of an inch), double polished (extra clear) and made in the southeastern United States. 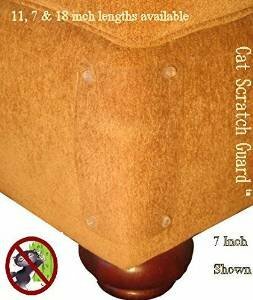 Don’t believe claims from copy”cat” sellers about durability or coverage because we developed this product in 2008 and NO cat has ever scratched through them or scratched a 1/2 inch to the left. These sellers try to mislead customers to promote a low quality handmade version…for more money. CATS WILL USUALLY SCRATCH AT THE STURDY PARTS OF YOUR FURNITURE. 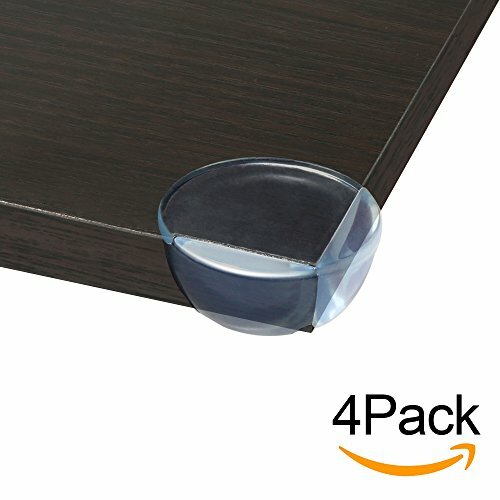 The sturdiest parts of your furniture are at the corners where the frame is and these guards cover that area. OUR LOW PRICE REFLECTS OUR DEDICATION TO SELLING A QUALITY PRODUCT AT A FAIR COST TO YOU. What you see is what you get. 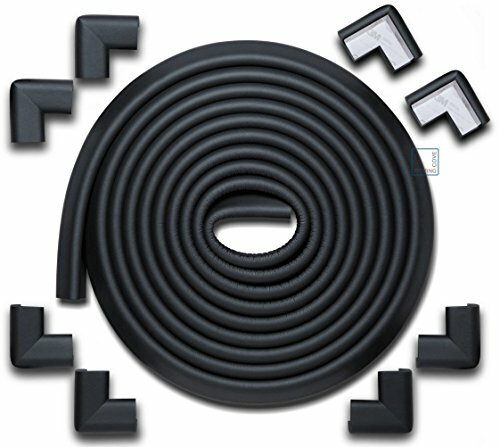 Our pins are shorter to ensure an easy installation and our vinyl is superior to any other. Our higher quality pins and vinyl make all the difference and by purchasing high volumes of these materials we are able to keep our prices low. Four extra pins included in every package.